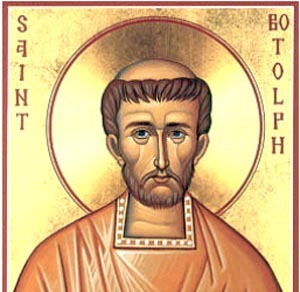 B ede makes no mention of Botolf, yet his mentor St Ceolfrith visited "Abbot Botwulf" in East Anglia around the year 670 according to The Life of St Ceolfrith. This describes Botolf as “proclaimed on all sides to be a man of unparalleled life and learning, and full of the grace of the Holy Spirit” (4). We shall see that this high ecclesiastical reputation related to his fame as a pioneer of Benedictine monasticism in England, which began at his famous foundation to which the Anglo-Saxon Chronicle refers as Ican Hó. We shall weigh the evidence for its most likely location on the former island hó on which the church of St Botolf at Iken now stands. We shall also consider St Botolf’s more general popularity as an exorcist and how he came to be regarded as a patron saint of travellers, especially those crossing water. S am Newton was awarded his Ph.D in 1991 and his first book, The Origins of Beowulf and the pre-Viking Kingdom of East Anglia, was published in 1993. Since then he has been researching, lecturing, and writing as an independent scholar in Wuffing and Early Medieval Studies for many years. His latest book, The Reckoning of King Rædwald, was published in 2003. He is also now a Director of Wuffing Education, NADFAS lecturer, and Time Team historian.